Much like the majority of games held over the course of the weekend, the 1st Place game at the international 2014 WFTDA Playoffs in Kitchener-Waterloo, Ontario, game down to the final seconds and was decided by only three points. In the end, a Canadian team took home the 1st Place trophy from the first ever WFTDA tournament held in Canada – the Rideau Valley Roller Girls of Ottawa, Ontario. 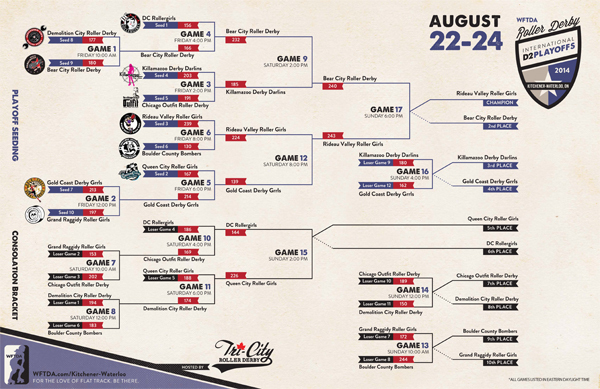 Placing a very close second was the weekend’s Cinderella story, Bear City Roller Derby of Berlin, Germany, who came in as the 9 seed with only 11 players able to travel for the tournament and pulled off multiple upsets over the course of the three-day tournament. Rideau Valley advances to the WFTDA Championships in Nashville, Tennessee, Oct. 31-Nov. 2 to compete against the Detroit Derby Girls, of Detroit, Michigan, in the Division 2 Championship game. Bear City also earned a trip to Champs to compete in the D2 Third Place game against the Fabulous Sin City Rollergirls of Las Vegas, Nevada. Bear City’s Master Blaster was named tournament MVP after scoring more than 500 points for her team over four Playoffs games. The Kitchener-Waterloo Playoffs weekend showcased the talents of the top Division 2 teams in games that often had the crowds on their feet cheering as the skaters fought through the last jam. If you missed out on some of the action this weekend, check out photos and game recaps in our Kitchener-Waterloo tournament blog, and keep an eye out later this week for the WFTDA.tv game archives! Congratulations to all the participating teams and thanks to all the officials, sponsors and volunteers who supported the event. Special thanks to tournament hosts Tri-City Roller Derby for welcoming the derby community to Kitchener-Waterloo!